No out of pocket expense at time of mechanical repair: (except for any deductible and any repairs not covered by the policy)-the covered repair is paid directly to the authorized repair facility. 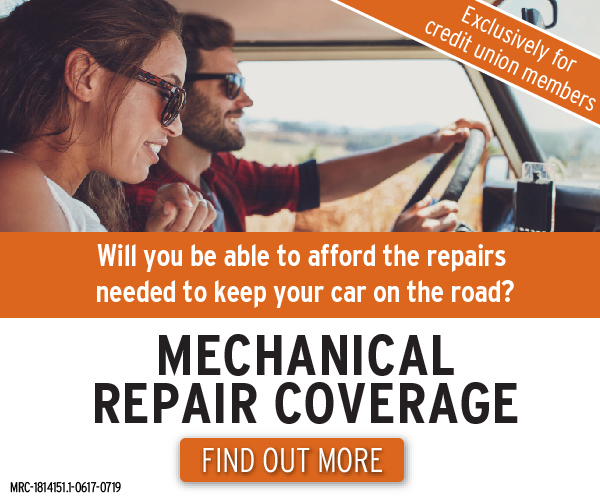 Mechanical Repair Coverage is only available for automobiles, and a loan at Spirit of Alaska or on the automobile is not required to purchase coverage. Program details may vary by state. Ask a Member Services Representative for details or receive a quote by calling 907-459-5970. Mechanical Repair Coverage is provided and administered by Consumer Program Administrators, Inc. in all states except CA, where coverage is offered as insurance by Virginia Surety Company, Inc., in FL, LA , and OK, where coverage is provided and administered by Automotive Warranty Services of Florida, Inc. (Florida License #60023 and Oklahoma License #861338), all located at 175 West Jackson Blvd., Chicago Illinois 60604, 800.752.6265. This coverage is made available to you by CUNA Mutual Insurance Agency, Inc. In CA, where Mechanical Repair Coverage is offered as insurance (form MBIP 08/16), it is underwritten by Virginia Surety Company, Inc.
Do I need a loan with Spirit of Alaska to buy Mechanical Repair Coverage? No, we offer Mechanical Repair Coverage whether or not your loan is here with us at Spirit of Alaska! Compare our very competitive rates with other offered products in the area. What types of vehicles can I put under Mechanical Repair coverage? Mechanical Repair coverage can only be used with automobile loans. Recreational vehicles and power toys are not available for coverage. “Modified” vehicles are eligible for coverage, but claims will be denied if resulting from the modifications made. What type of deductible will I have to pay for repairs? Deductibles are paid per repair visit, not per item repaired. Deductible options range from $0 to $500, depending on the coverage plan. How do I know if my vehicle qualifies for a warranty? Coverage is available for any new or used vehicle current through 15 model years old with 150,000 odometer miles or less at the time of coverage purchase. Exceptions exist for European/Luxury* vehicles, which only qualify with 100,000 miles or less. How can I pay for Mechanical Repair Coverage? If you are purchasing MRC with a loan, you can finance the cost of the coverage into your payment, which is often the easiest and most convenient method. Alternately, you can pay for the coverage with cash, check or credit card to the credit union, especially if you are not financing a loan on the vehicle with us, or have a loan elsewhere. Alaska does not charge sales tax on purchase of Mechanical Repair Coverage. However, a number of other states require sales tax to be collected on the sale of MRC. If you are currently living in one of these states when you purchase coverage with Spirit of Alaska, sales tax will be charged on the retail price.